Are you looking for a health breakthrough? Ready to take the next step toward your health/fitness goals? Tired of being tired? Want to learn how to make simple steps towards achieving a healthier more vibrant YOU? Our Shred10 Detox Program helps you learn how to live a healthier lifestyle. Because the Shred10 is a virtual program you can participate from anywhere and invite friends & family to get healthy with you! Improved energy throughout the day! Increased confidence in pursuing and achieving health and fitness goals! Many programs include complicated meal plans and formulas for success. Shred10™ is a simple program that anyone and everyone can follow. Guidelines are backed by health professional recommendations found in the Shred10 Guide Book. During the Shred10™, participants do not need to track grams of anything, calories, or points. There is no food deprivation that will leave you hungry or fatigued. Simply eat foods that fall in the parameters of the guidelines until you are full, then stop eating. Easy. Juice Plus+® trio capsules and Complete® shakes are no-brainers. They are simply fruits, vegetables, and berries in capsules and shakes. There are over 30 clinical studies published in reputable peer-reviewed medical journals that show how Juice Plus+® and Complete® are beneficial to the human body on many levels. During the Shred10™, the cost of the Juice Plus+® capsules and Complete® shakes is so affordable…literally just a few dollars a day for two very filling shakes and 45 different fruits, vegetables, and berries. All of the other resources, educational tools and support are complimentary parts of the program. 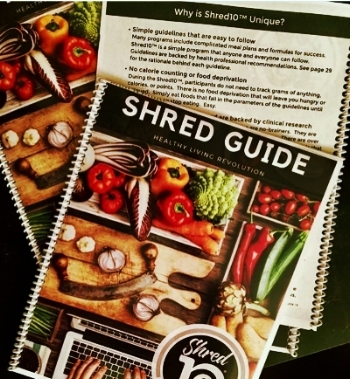 All participants receive this “Shred Guide,” a 40+ page eBook that answers questions about the Shred10™, and provides healthy meal ideas, over 15 smoothie recipes to try, and a great deal of snack ideas. Participants will also receive a cascade of education they can access before, during, and after the Shred10™. The Facebook support community and connection with others is one of the best features of the Shred10™. Without a community of supportive friends, the Shred10™ isn’t nearly as fun or effective. To enroll in the Shred10 program, place your Plant Micro & Macro product order by visiting our Plants & Prevention page. Our Ultimate Lymphatic Detox Program, includes the Shred10 monthly cleanse AND 4 health coaching & detox lymphatic massage sessions. In a toxic world with digestive strength for most folks in decline, the lymphatic system (the body’s drainage system) can easily get congested. While going through a cleanse, receiving lymphatic massages are a great complimentary treatment to assist the body’s detoxification process. LEARN MORE HERE.